Indian real estate giant DLF Ltd, on Wednesday, announced its exclusivity agreement with Singapore’s sovereign wealth fund GIC Pte to buy out 40% of the promoter’s stake in DLF Cyber City Developers Ltd, its rental arm. The rental subsidiary has been operating with a Net Profit Margin higher than 40% (even 50%) in some fiscals. 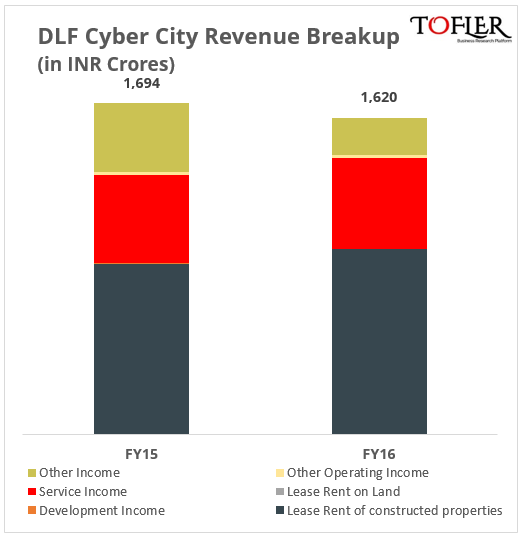 DLF Cyber City Developers Limited was incorporated in year 2006 and its primary business is ‘Rental or leasing services of factories, office buildings, warehouses’. This company is owned 52% by three other companies – SIDHANT HOUSING AND DEVELOPMENT COMPANY, RAJDHANI INVESTMENTS AND AGENCIES PVT LTD and BULAND CONSULTANTS AND INVESTMENTS PRIVATE LIMITED which in turn are fully owned by the DLF group promoter Mr. Kushal Pal Singh and some of his family members. Remaining 48% is held by DLF Limited. This shareholding structure is as on March 31st, 2016 declared by the company in its FY16 Annual Return submitted to the Registrar of Companies. The company has reported revenue of INR 1620 crores for the FY ended 31 Mar 2016 along with a Net Profit of whopping INR 654 crores. This translates into a net margin of 40%. The company has been seeing a Net Margin north of 40% and even 50% for most of the recent years. For the FY ended 31 March 2015, the company had reported revenue of INR 1694 crores with a New Profit of INR 742 crores. Lease rent for constructed properties accounts for about 58% of the total FY16 revenue of the company while the service income accounts for the second highest share with 29%. The former includes the ‘base rent, parking income and fit-out rental income’ while the service income pertains to the maintenance services provided by the company to its tenants. The Other Income primarily consists of ‘Income income on loans to related parties’. 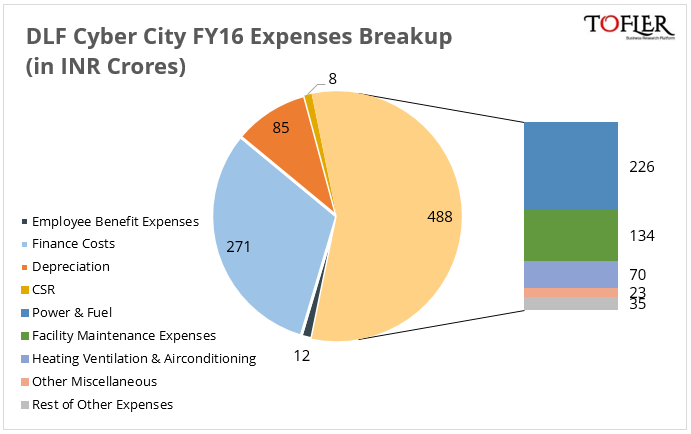 Finance Costs account for the largest chunk of its expenses with a contribution of about 31% followed by the Power & Fuel contributing about 26% of its expenses. The company had a Net Worth of INR 6,908 crores as on March 31st, 2016 with a Debt of INR 5,678 crores. 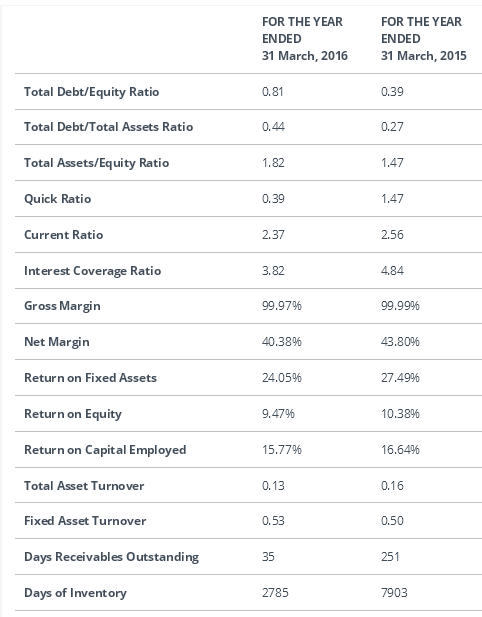 Its Debt/Equity ratio shot up to 0.81 from 0.39 in the previous year. Valuation of the company is estimated to be INR 32,000 to INR 36,000 Crores and the stocks sale is expected to fetch more than INR 12,000 for the promoters.